Kenya’s Lunatic Line: Riding the Iron Snake’s Last Run (Conclusion) – Greg Kelsey. Writer, traveller, fumbler. At 7:30, a tinkling bell wanders through the carriage, announcing dinner, and I make my way to the dining car. The rest of the first-class passengers are already there, and I’m asked to squeeze in with a pair of Polish fellows. Nice chaps. They, unlike me, have beer. Two enormous, camouflaged guards join us for dinner, toting equally enormous automatic weapons. They sling them around rather carelessly, squeezing into their table. I ask the waitress for a beer, and she promises to get me one, but doesn’t. A different waiter comes by, and I ask him for a beer. He nods. Again, no beer arrives, but the food does–rice, cabbage, beef or chicken stew. We eat from ancient crockery with silverware on cracked leather seats. Immobile bakelite fans provide no relief from the heat. At one time, this may have been swish. In its early days, this service hosted dignitaries like President Roosevelt: he rode primarily on the front of the locomotive, in 1909. I walk to the kitchen, where I remind them about the beer. Yes, someone will bring it. And this time it arrives, just cold enough, and I’m thankful. Dinner is rounded off with tea and fruit. It’s not gourmet, but adequate. My new Polish friend extracts a bottle of vodka that he brought with him against just such a contingency and shares it around. It’s sweet, spicy and citric. He teaches us to say “cheers” in Polish. (“Naz-droh-vee-ay“). After dinner, we retire to our compartments, which are still hot, despite the open window. The lower bunk has been made up into a bed. It’s not an easy night’s sleep. The train lurches between dangerous out-of-control speed, listless meandering, and complete inactivity. Well after midnight, the temperature cools sufficiently for me to pull up the blanket. My sunburn stings and these sheets are rough. The next morning, the bell tinkles at 7, and I dress for breakfast. Baked beans, a small sausage, fried egg and toast, and get out we have another sitting. The countryside is different now: wide plains and small farms. Larger, wealthier houses appear, and the occasional herd of zebra and wildebeest. We stop to pick up locals at small stations, neat grassy affairs without platforms. There is no drama or pushing, just the occasional box of clucking chickens. By the time I took my journey, in late 2016, the Lunatic Line was on its last legs. Its final trip was on 28 April 2017. Construction of the new standard gauge railway (“The Madaraka Express”) was completed in December 2016,with the first passenger service on 31 May 2017. The journey should now take only 3-4 hours, and will be President Kenyatta’s legacy – should he survive the disputed 2017 election. The new track generally follows the old route and was 90% funded by China at a cost of $3.6b USD. It’s eventually planned to connect with other standard gauge lines in East Africa and is constructed with viaducts and embankments to allow wildlife to cross safely. 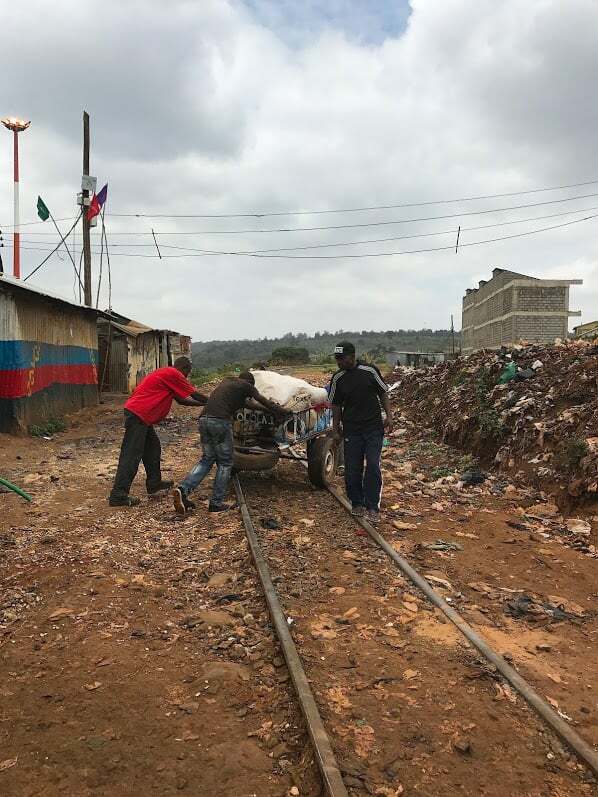 As we approach Nairobi, the train passes through Kibera, Nairobi’s largest slum. Four million people live here, cheek by jowl, without running water. Again, children jog by, yelling “Jambo” and dodging the community’s refuse. At Nairobi Central, the train wheezes in, not a moment before it’s due, and I exit. I need my ticket from the booking office, and a guard retrieves it for me, allowing me to depart the aging platform. This colonial edifice contains a railway museum for the trainspotters, and I suspect that the Lunatic Line will find its own way there soon. In the meantime, I hope that the new modern line is symbolic of an emerging Kenya. Diani Beach is a short trip south of Mombasa. Uber is available in Kenya, and much cheaper than taxis. In Nairobi, stay at the five-star Sarova Stanley hotel, first open in 1902, and a favorite of Ernest Hemingway’s. Check out the rest of GoNomad’s awesome stuff while you’re at it!